While many will associate medicine ball workouts with the core, you also can perform some great upper body exercises with them as well. Your golf resistance training program should be well rounded, and I strongly feel that medicine ball exercises should be a part of it. 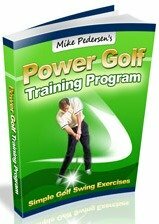 The golf swing demands quick bursts of strength, muscle control, and stability. Medicine ball workouts will help improve all of those aspects! These workouts could also be classified as plyometric exercises. Plyometric drills are entirely based on quick bursts of energy, in contrast to more tradition strength training with either free weights or machines. Many of the exercises listed here involve throwing, or tossing, the ball to a partner, so make sure you have someone available to help. Better yet, partner with someone who is also weight training for golf and you will both share the benefits of these exercises. Remember, you can be injured while performing these exercises so please consult your physician or golf fitness professional prior to beginning any strength training program. For most people, medicine ball workouts will be a progression up from more basic exercises. They are more advanced, thus requiring proper technique. Only perform them if you are sure you can perform them with the correct form to reduce the risk of injury. They come in various weights/sizes, and their outer covering is easy to catch and grip! 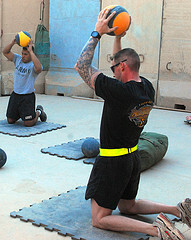 -This medicine ball exercise will help increase chest and arm strength. - Stand, facing a partner, holding the medicine ball at your chest. -Perform chest passes back and forth, focusing on quick bursts of strength. -Start by lying on your back, holding the ball with your hands at your chest. -Perform a quick chest pass, throwing the ball in to the air. -Be prepared to catch the ball on the way down! -Focus on trying to toss the ball as high as you can. -Start standing, holding the medicine ball behind your head. -Perform an overhead pass to a partner (think along the lines of a basketball pass, or soccer throw in). -Same as above except kneeling. -Will require more core strength and hip stabilization than the standing version. -Place the ball on the ground, and assume the standard pushup position, however, have both hands placed on the ball. -Perform a push up, lowering your chest to the ball. Variations: This exercise could be performed with both hands on separate medicine balls, one hand on a ball and the other on the ground, or in incline/decline positions. -Lie on your back on top of a stability ball, with the ball positioned between your shoulder blades. -Lift the medicine ball behind your head, and then quickly throw it forward, focusing on maintaining your stability on the ball. -Start standing, holding the ball with both hands at waist level. -Perform a deep squat, lowering the ball between your knees. -Quickly rise out of the squat, and at the same time, take the medicine ball and throw it straight up into the air as high as you feel comfortable.